The Fast & Light Mountain bike tires will help you to be quick and save energy.Thanks to the most advanced Mavic technologies these tires offer lightweight, responsiveness and efficiency. They are the perfect combo for fun and performance on the trail. 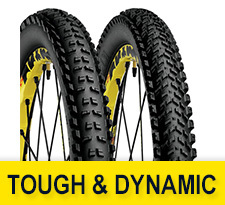 Mavic Tough & Dynamic products are made to last. 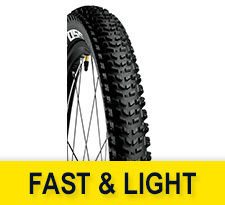 Mavic uses key technologies and makes these tires efficient and pleasant to ride. They test their tires on strength and reliability.